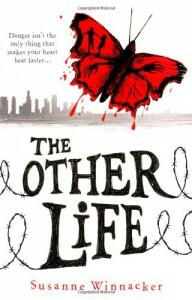 The Other Life had an interesting premise; people forced to go 'underground' due to an outbreak of the rabies virus. I enjoyed how the main character, Sherry, used numbers to show how long it had been since she'd seen the ocean, eaten chocolate, etc. Instead of 3 months, she would use 90 days, or ____ number of minutes. I thought it was fun. The first 2/3 of the book was slow and I kept stopping because of words that, in my mind, were misspelled. It bugged the crap out of me. However, the pace and plot definitely picked up in the last fifty or so pages. The ending was excellent and I will probably read the next one because of it.